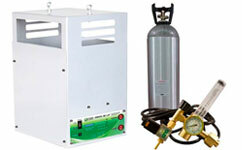 CO2 generators can produce up to a 20% increase in plant growth and yields. It’s no wonder it’s a popular enrichment product. Knowing how and when to use it will save you big. Learn more about the benefits to adding CO2 to your grow today! It is important to ensure optimal CO2 levels in the grow room or grow tent. Outdoors, typical CO2 levels are around 400 ppm, but plants can benefit from CO2 levels of up to 1,500 ppm! How does CO2 affect plant growth? Plants use sunlight (or in our case, grow lights) to convert CO2 into energy. This energy is used for a number of functions, such as plant growth. When we supplement our grow room with additional CO2, our grow lights become more effective, as our plants can absorb more of their light. This leads to increased yields of up to 30%, some growers say! If you are using MH and HPS grow lights or LED grow lights, using a CO2 burner or CO2 tank and regulator can have incredible effects on your plant! Less intense lights, such as fluorescent grow lights, will see less of an effect. What is a CO2 tank and regulator kit? CO2 Tank and regulator kits are a great way to add CO2 into the atmosphere in your grow room, to drastically increase yields while cutting down on vegetation time! These kits are perfect for larger-scale growers looking to increase CO2 without increasing the heat in the room. These are cheaper than a typical CO2 burner, and maintenance is mostly limited to refilling the CO2 tank every so often. However, moving the tanks from the garden can be a hassle, especially if the grow room is in a remote location. What is a CO2 regulator? The job of the CO2 regulator is to control the rate at which CO2 is released from the tank, as to maintain the level mentioned earlier. The regulator will not allow the CO2 in the room to fall below or raise above a certain level. What is included in a CO2 tank and regulator kit? Not sure which tank and regulator kit is right for you? Give our expert growers a call at 888-815-9763! To learn more about creating an environment that will substantially increase your yields, check out our learning center where we go in depth on a number of topics!